Get this amazing and very well presented Police Tankard Gift! It comes with Handcuffs attached to the side as a handle. Great leaving or retirement gift! We all know most coppers enjoy a pint or two! So why not treat them to this really awesome Police Tankard Gift Set! If you know that special police officer or someone who is retiring after a full service then this Police Tankard would be the perfect gift. The Tankard hold one pint (of their favourite brew) with images depicting the history of the police force. 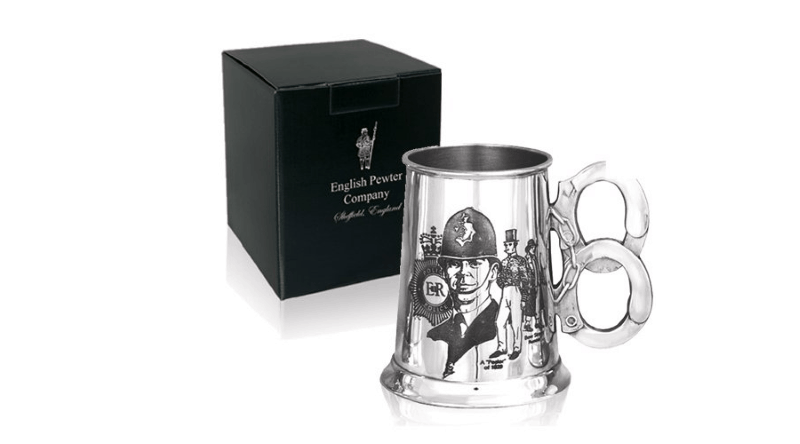 However it also has expertly crafted and designed pair of handcuffs attached to the side which is the handle of the Tankard – This gives the gift that extra special edge and looks amazing! It stands 13cm tall and 8 cm wide and comes beautifully packaged in the presentation box with the English Pewter Company beefeater logo on the lid.